The Jaltarang, one of the most rarely heard instruments today, is among the oldest instruments in the world. It consists of china bowls filled with water and struck by two wooden sticks. 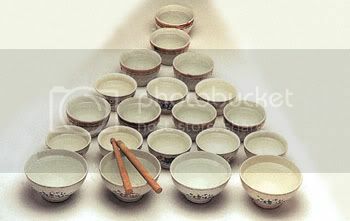 Earlier, since china clay bowls were not available, artists used to play this instrument with metal bowls. Each bowl can be tuned to the desired frequency by varying the quantity of water in it. These bowls are placed in a semi-circle arrangement around the artist and played. The Jaltarang has a pleasant characteristic tone similar to the Feng Shui wind chimes. The player can produce on it, classical Indian Ragas and light melodies as well. Jaltarang is a unique instrument in the sense that it is both a percussion, as well as non-percussion instrument. Jaltarang is a dying art. Inspired by Jaltarang, glass music became popular in sixteenth century Europe using glasses in place of cups. 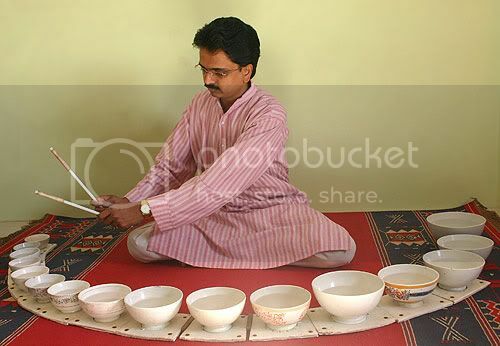 Another variation of the Jaltarang is found in Jaisalmer district in Rajasthan in India, where a single metal plate, called the thali, filled with water, is used as an accompaniment by applying strokes to produce different tones and rhythms. It is called Jaltaal. Although Jaltarang has been prevalent for over five hundred years, the instrument attracted attention in the first half of the 20th century. Jaltarang was extensively used in film music and orchestral compositions until recently. The song posted above from the Hindi movie Kaamchor (1982) is a good example of how Jaltarang could be used with amazing effect. However, this instrument is losing its popularity because the lack of ease the artists feel while trying to play the more complex Ragas. Very few artists in recent times have been able to adopt it as their main instrument for classical performances. Among these few are Milind Tulankar, Ragini Trivedi, Ranjana Pradhan and Anayampatti S Ganesan.